We’ve spent countless hours researching the various watches available from the Glycine brand and reviewed each collection carefully. For our verdict, we’ve concluded with our Glycine watches review that they are definitely worth the investment for those who mainly rely on their watches as they travel. One of our top picks is the KMU GL0133 as part of the KMU48 collection. Glycine watches are crafted to be sturdy, accurate and easy to read at just a glance. These incorporated elements make it ideal for those who travel for a living. Whether you’re a businessman, pilot, or in the military, you’ll enjoy the ease and style of the Glycine watches. However, the brand itself isn’t cheap, which means you should be receiving a sturdy watch. Most of their collections range from mid-tier pricing all the way to luxury. Although, it depends on which collection you’re looking at. For example, the Airman and Combat are high end and features multiple clocks, measurements, and more. On the other hand, the KMU 48 and Incursore are more affordable and features a simplistic but sturdy design. 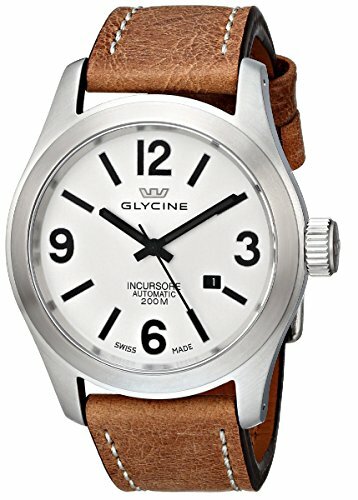 Overall, the Glycine brand has our approval as they have created a number of watches that has satisfied pilots since 1914. As for which watch we’d recommend is the KMU GL0131. Would We Recommend Glycine Watches? Glycine was founded by Eugene Meylan in Bienne, Switzerland in 1914. Eugene was an outstanding craftsman who specialized in watch engineering and wanted to change the game with his new designs. He believed in striving for perfection and set out to craft watches that were more accurate and technologically advanced for the era. Over 100 years later, the brand continued to thrive through Eugene’s base designs. Their goal was to craft distinctive watches that had a classic design that is unique to the time. Each watch is meant to be timeless but also hold true to the modern era without latching onto mainstream ideas. Today, the brand continues to incorporate Swiss aspects and are crafted for pilots, travelers, and pioneers in aviation. Besides these, travelers alike flock to the Glycine brand because they craft accurate and reliable watches designed to be read at just a glance. This makes them one of the top picks for military personnel and travelers. The KMU GL0131 is renowned for its big size and large watch face, perfect for those who want to tell time at just a quick glance. It’s a remake of the classic Glycine collection that came out in 1999. However, this version is adapted with enhanced engineering and refined style – perfect for military personnel. All watches in this collection feature precise automatic movements which help keep accurate time while traveling. Plus, the extra large casing is made from durable materials such as high-grade stainless steel and a non-scratch surface. Lastly, it uses a PVD coating, making it both stylish, sleek, and durable. Do you want a watch that feels more sleek and modern? Well, the KMU 48 collection features watches that have an updated look compared to others. The surrounding metal is painted with a matte black PVD coating to help give it a more sophisticated look. Plus, the PVD prevents the paint from flaking off or scratching over time. On top of that, this version comes with a light brown leather strap that’s waterproof and durable. There’s a belt buckle is adjustable to your wrist size. Luckily, if you don’t enjoy the light brown color, you can swap the band out for another or purchase a matte black leather strap from them. The colors on the watch face are each painted on, using bright orange and white. Why is this useful? If you’re traveling, you may not have the best lighting conditions to read your watch. Using this type of paint enables the person to be able to read the watch in dim lit conditions. Plus, each number is big and noticeable, making it easier to read at just a glance. The casing features high-grade stainless steel which is approximately 48 mm in diameter. For extra protection, there’s a waterproof coating which can protect up to 10 atm, enabling it to last through a bit of rain or a quick dunk. From there, the back is secured through multiple screws and includes durable mineral glass. The glass that’s on top of the watch face is crafted from flat sapphire and includes three different anti-reflection layers. Overall, this provides enhanced sturdiness and durability – perfect for those on the go. So, what’s our Glycine watches review verdict for the KMU 48? We’d say that this watch tends to provide excellent visibility and protection – which is good for travel. Although, it does lack on other features a mid-tier priced watch may have such as digital screens or additional timezones. If you’re looking for a classic watch that’s easy to read and features a simplistic yet rustic design, and then it’s well worth it. However, if you’re expecting more features, then you may be disappointed. The battery only lasts around 38 hours, and the watch face only counts hours, minutes, seconds, and the date. The Incursore GL0044 is another oversized watch that’s designed to be simplistic and sturdy. It’s a newer collection that’s been crafted for the modern era. We’d say that it’s the perfect fit for military personnel or civilian use due to its durable and simplistic design. Visibility is a growing issue with newer watch faces, as the dials tend to over-congest the screen. If you look closely, the face includes giant numbering and big dials to help make telling the time easier. It’s great for those in need of a watch for glancing at the time throughout their day. This includes the three different dials which are different lengths and widths. Design wise, and the Incursore is one of the best for rustic and classic looks. Because it was initially designed for military personnel, it features a simplistic design. The lack of extra coloring and details make it blend well with most attire. If you’re looking for an all-around daily watch, then you’ll be satisfied with the design of this one. The Incursore’s outer casing is made from high-grade stainless steel, which adds to its durability. Besides this, it includes see-through mineral glass that is crack and scratch resistant. Lastly, the flat sapphire glass has three different layers of anti-reflective coating which make it easier to read throughout the day. For our Glycine watches review, we believe that the Incursore is only worth the price if you’re expecting a durable and simplistic readable watch. Other than that, it doesn’t include any other elements and lacks extra features. 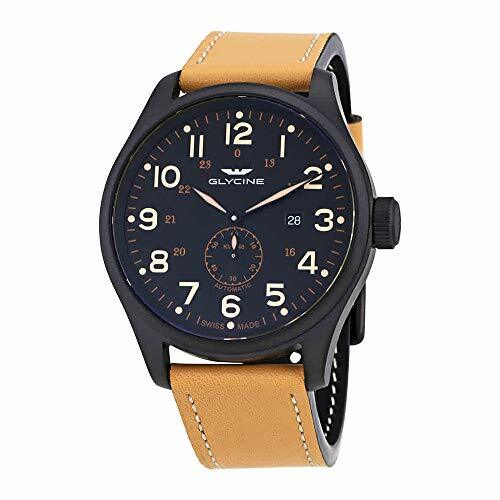 It’s a good everyday watch to blend with uniforms or other casual attire. The time is accurate, which is good for those traveling, but besides that, it doesn’t have much going for it. The Airman 42 Collection is another fan favorite, but it includes high-tier watches. It’s known as being the ultimate travel watch because of its precision and unique ability to have multiple timezones displayed on the watch. These qualities combined with its stunning craftsmanship and smaller details make it one of the best in their line – but also the highest priced. If you’re looking for a watch where you can pull it out and have all the information literally on your wrist, then you can’t go wrong with the Airman. It lists hours, minutes, seconds, date, GMT, and even a third-time zone. Essentially, you’ll have every bit of information needed with just one glance. As for the watch face, you’ll see that there’s a domed sapphire crystal which features three layers of anti-reflective coating. This includes on the underside as well. Besides this, there’s a polished yellow-green Super-LumiNova that helps you see in dark lighting. As a nice bonus, each number is hand painted onto the watch face, which makes it a bit unique compared to other models. The last feature we have to discuss is the exterior. It is similarly designed as the previously reviewed watches and includes high-grade stainless steel. The Airman 42 includes a black PVD coating, satin polishing, and smoked glass. 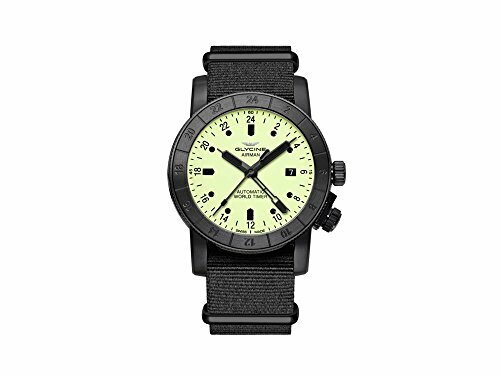 Other than that, it comes with a durable black pilot strap. So, for our Glycine watches review, we believe the Airman 42 is one of the more expensive watches in their collection. Besides the fact that it comes with useful information, we’d have to say the drawback comes with the fact that you’re not getting better quality materials. The watch uses similar materials in their low and mid-tier collections, which ultimately is not worth the extra money. Other brands tend to give you more information as well. So, is it really worth the investment? Luckily, their Airman Collection features a wide range of watches at different price points. Overall we’ve concluded for our Glycine watches review that if you’re looking for a classic design and reliable reading on time, then you’ll be happy with their brand. Their low and mid-tier collections feature numerous choices – all in different styles. It’s honestly hard to go wrong with choosing a watch from their selection. However, their high-tier luxury watches just don’t make the cut. They don’t really include much information, even if you get ones that list more than the date and time. Pair this with the fact that the watch face tends to get congested, which makes it harder to read. As for our conclusion, it’s really up to you whether you find this brand worth it or not. Their watches are okay, but other brands like Bulova and U Boat tend to create better modern watches. If you’re looking for casual, rustic, day to day watches that will withstand everyday use – then they’ll work. But if you’re looking for a luxury or high-end watch we’d say look elsewhere.